Sanchi is small village about 46 km from Bhopal, the capital city of Madhya Pradesh. It is one of the oldest pilgrimage points in India. The stature of Sanchi holds high credential in India, apart from being a highly devoted Buddhist pilgrimage point in India, it also offers as a synonym for the Buddhist architecture that flourished during the Kingship of Ashoka. There are a number of Stupas and monasteries that provides the affidavit for the glory days of Buddhism in India. The glorious Sanchi Stupa is believed to be the oldest stone structure in the world and is one of the UNESCO World Heritage Site in India. The city that went into oblivion was rediscovered in the year 1818 AD by the General of Madras Cavalry General Taylor. The establishment of temples, stupas and monuments in Sanchi were commenced under the order of King Ashoka during the 3rd Century BC. The entire construction lasted until the 12th Century AD. The National Emblem of India the Ashok Pillar was also constructed during this period. Sanchi was earlier a renowned trading place, which gives it, its name. Many traders from Vidisha also contributed in the construction and maintenance of the Buddhist testimonials. Sanchi may have been raided a lot of time but it never lost its glory. The Gupta Temple, along with the many facets provides enough evidence of the artistic splendor that was present in India. 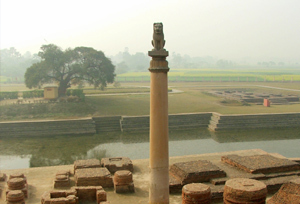 Ashoka Pillar: Established in the 3rd Century, it flaunts the Greco-Buddhist Architecture in India. Unlike other ancient monuments, this pillar still glitters and sparkles as if it were polished yesterday. The crown of the pillar is placed in the Sanchi Museum; however visitors could witness the well proportioned beam near the Sanchi Stupa. Buddhist Viharas: Sanchi is the live example of all forms of Buddhist architecture in India. These viharas were made up of woods unlike the monasteries we see today. The unmatched splendor on witnessing this posh art is hard to forget. The Gupta Temple: The Gupta Temple is one of the oldest temples ever built. The temple exemplifies all the principles that were needed to be followed while constructing a temple. The proficient work of the temple exuberate the splendid artwork of the by-gone era and acted as a herald for Indian Temple Architecture. Sanchi Museum:The Sanchi Museum has cosseted the culture, traditions and architecture in India. Assorted gateways, Toranas parts, the crown of the Ashoka Pillar, Pottery are the few items that are to be found. Based in the most pompous surrounding, a visit to the Museum is very a distinct experience. 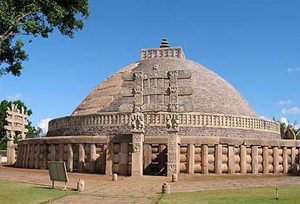 The Stupas: There are many stupas including the Great Stupa of Sanchi. These stupas were built to keep the vestige of disciples of Buddha and some of his disciples. These are a unique work of design that is hard to find elsewhere. By Air: The nearest Airport is in Bhopal which is about 65 km from Sanchi. One could board flight from Bhopal to all the International Airports of India. By Road:Sanchi is well connected to all the major cities of Madhya Pradesh. Many private and state transportation facilities are available for Sanchi. By Train : The nearest railway station is at Bhopal which is approx 50 km from Sanchi.